On today’s program we speak with Alan Day, a rancher from Arizona who back in 1988 started a wild mustang government subsidized sanctuary in South Dakota. Alan cared for 1500 horses on 35,000 acres. It was the first project of its kind and there was much to learn. Mr. Day had run cattle on two other ranches, one of them the Lazy B, a 175,000 acre ranch in Arizona. But these were wild mustangs. To properly manage the land the horses would have to be moved from pasture to pasture. Did I mention they were wild mustangs? With careful consideration to the horses’ welfare, Alan developed a way of training the wild mustangs to follow his ranch horses from one pasture to another. Slowly he was able to gain their trust and the horses thrived on his ranch. 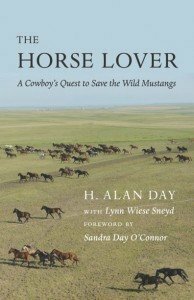 Alan Day has written a book, The Horse Lover, A Cowboy’s Quest to Save the Wild Mustangs, chroniclings the events that led up to the creation of Mustang Meadows in South Dakota and the ranch’s day-to-day operation. Along the way, Alan intersperses stories of his own experiences with horses. From his first horse, Chico to Aunt Jemima, Alan has a world of stories to tell, some funny, some poignant, all captivating, about the partners he shared his work with. 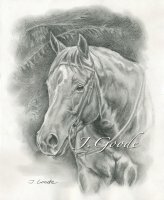 You can find out more about Mr. Day by visiting his website www.thehorselover.com. It has a blog where Alan’s stories about horses, ranching and the West are being posted, and also where he will be speaking. Special thank to Alan Day and Lynn Wiese Sneyd for setting up this interview and giving us some insight into the world of wild mustangs. I love your podcasts! I am planning horseback trek from Santa Fe New Mexico to Bozeman Montana beginning in May. i would love to talk with about this adventures and possibly share it with your listeners.